(Translation) BBC Mundo looks at the secret behind Germany’s World Cup success in Brazil, which may also leave a positive legacy for the local community that supported the winning team. The German players and staff interacted with the local population during their stay in Brazil for the World Cup. Photo courtesy of Getty via the BBC. They took their fourth World Cup title, scored the most goals, and gained widespread recognition among fans and commentators as the world’s best team; but Germany also won another world title far away from the Maracanã stadium. While hundreds of thousands of people welcomed their heroes home in Berlin, on the other side of the Atlantic a small Brazilian locality continued to celebrate the Germans’ World Cup campaign with their black, yellow and red flags. For the 900 or so inhabitants of Santo André, some 600km to the south of Salvador (Bahia State), Joachim Löw’s team had been proclaimed “champions” before they had even kicked off in the tournament. It was in this remote location, filled with idyllic beaches and abundant natural resources, that the German Football Association (DBF by its German initials) decided to set up its base camp in order to prepare for Brazil 2014. Ahead of this decision, there were no buildings or any type of sports-related infrastructure; just a 15,000m² terrain on which Germany constructed a tourist resort of 14 houses, a gymnasium, a spa, a floodlit football pitch, a swimming pool, and an auditorium for team meetings. The US$40m complex was no whim, though. Nor did it cost a thing for the local population, historically a fishing community, or for the regional government, or indeed for the DBF, who had outlined a long-term plan to determine the impact the project would have long after the German team’s objective of becoming world champions had been achieved. 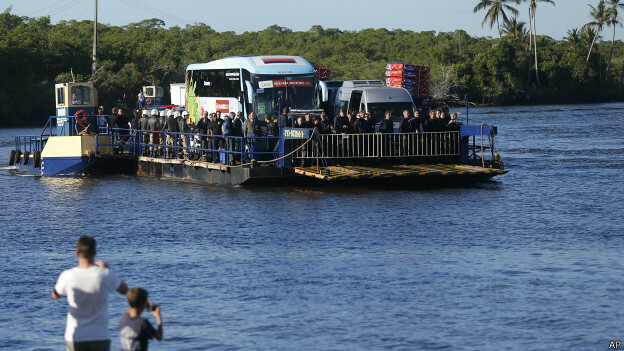 The German squad travelled by barge in order to arrive at Campo Bahia. Photo courtesy of AP via the BBC. Campo Bahia, as the site has come to be known, was dreamt up by Christian Hirmer, a German businessman who works in the fashion industry in Munich and is a friend of the ex-footballer and German Team Manager Oliver Bierhoff, and is also financed by private sector investors. For Hirmer the motto is simple: “the best team should have the best training centre”, something that Germany certainly ended up demonstrating. “The village has been fundamental to creating a special team spirit among players”, added the defender Benedickt Höwedes during the tournament. Löw described it as “a brilliant concept. It was a really good idea to accommodate us in a resort rather than in a hotel”. In sporting terms Campo Bahia was a success, but now it remains to be seen how viable its legacy can be. The complex will be opened to the general public as a sustainable and ecological tourist resort, with various activities being offered such as fishing and surfing, which should encourage the economic development of the local community. The majority of the inhabitants of Santo André who were employed during the World Cup in order to meet the demands of the German players and staff, will form the centre’s labour base in the future. The reach of the agreement between the DBF and the local government also extended to the modernisation of local football pitches, the creation of an academy, and the renovation of one of the village’s orphanages. It’s more than ten years since Germany set off on the long road to success culminating in their fourth world title. They changed the grassroots of their country’s football and completely changed the set-up of their team. In Brazil, Die Mannschaft (as the team is known back home) triumphed with a different – or even unique – brand of football. And it was in being different that on that famous Sunday evening, a thousand kilometres away from the Maracanã, that the population of Santo André also came to cry “Champions!”. 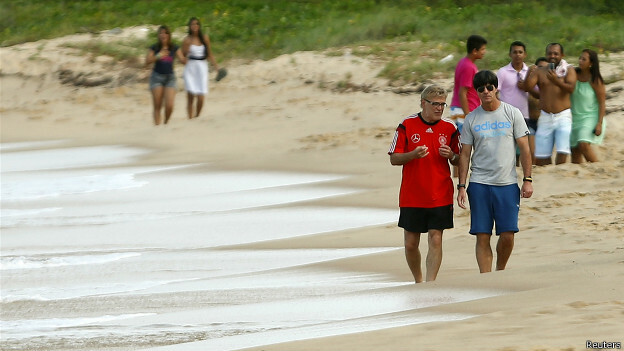 Long walks on Campo Bahia’s scenic beaches helped team coach Joachim Löw find the inspiration that helped Germany win the World Cup. This is a translation of an article that originally appeared in BBC Mundo; the Spanish original can be found here. In other news not covered by the BBC Mundo article, German star Mesut Özil has revealed that he is donating his World Cup winning bonus to support the treatment of sick Brazilian children. Özil had already supported 11 children prior to the World Cup, but after picking up his US$400,000 bonus he announced that he would extend this support to 23, “since the victory of the World Cup is not only due to eleven players but to our whole team”.